Harold fires Ryan. Lochy promises to get Ryan's job back for him. Keryr comes over to see Melanie. She's expecting Kelvin, so is kind of disappointed that it's only Kerry. Melanie tells Kerry that she and Kelvin are having trouble - he stood her up last night and now he's not answering his phone. Melanie looks upset and very down. She's starting to think that Christina isn't lying after all. Kerry suggests she just confronts Kelvin. Melanie says Kerry is very good at advice and she should take over "Dear George"! As Kerry is leaving, Kelvin turns up with some flowers to say sorry for standing her up last night. Apparently Kelvin's mother was ill. 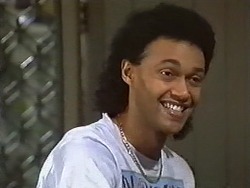 However, there's a bit of a discrepancy in the story he tells Melanie, but he quickly brushes it off. Melanie trusts him and apologises to him for being suspicious. MELANIE: I know I can trust you, no matter what. Joe is reading stories about garden fence precedents to Kerry and Madge. 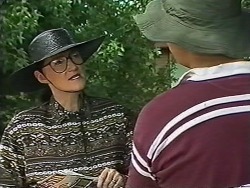 Madge thinks Dorothy has a good case legally, so maybe he should just get on with moving the fence. Joe says he's really doing it for his mother - she loved the house and he's got to win the case for her. 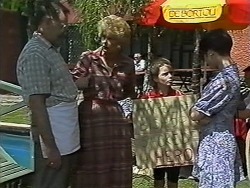 Lochy is marching up and down wearing a sandwich board stating "Harold Bishop sacked a hero". Harold is testing out crepe recipes in the kitchen. Apparently he tasted some wonderful ones in England, but the cafe owner wouldn't give him the recipe. 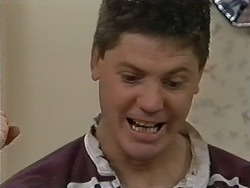 Paul comes in and tells him what Lochy is doing outside. He goes out to have a look. Some of Harold's customers start telling Harold that he's a terrible man(!) 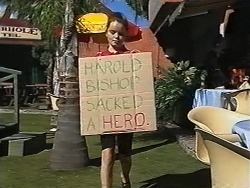 Lochy smiles triumphantly and starts chanting, "Harold sacked a hero". Kerry and Madge have arrived. Kerry wants to take Lochy home, but Lochy says that Kerry has always been a champion for the right to express her opinion. Kerry has to concede that she's right! Kerry and Lochy have arrived home. Joe tells her triumphantly that he's found a loophole in the fence legislation! 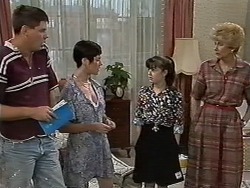 Madge is telling Dorothy that Joe is a good man and is trying to defend the house for his mother. Madge points out that Joe has had a very rough time. His mother had a heart-attack and by-pass surgery, leaving him to make a mercy dash to London. Then his work partner moved to New Zealand, leaving him and Kerry with very little money. Finally, his little boy who he adores has gone to Darwin to live with his mother. Dorothy is surprised to hear all this and says she feels even more guilty now for interfering with Kerry's child-minding business. She tells Madge that Joe should have taken time to talk to her, but Madge says that Joe is too proud. DOROTHY: You've certainly given me something to think about. 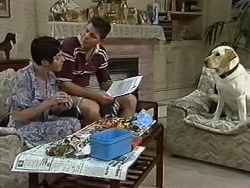 Melanie is sitting dreamily with Kelvin telling him how much she loves him. Kelvin says he feels so much more confident now and looks better too, with the contact lenses. Melanie goes into the shop to pay the bill. When she's gone, a girl called Andrea comes over - Kelvin left his watch at her place last night. Melanie comes out of the shop just as Andrea is leaving. Kelvin claims that she's just one of the customers from The Brasserie. There's a knock at the door and Madge answers it to a stranger with a bag. To her surprise, it's Eddie Buckingham who they met in London. EDDIE: You told me in London to look you up if ever I was here, and well...I've arrived! Eddie telle Madge and Harold that they told him such wonderful stories about Australia that he decided to come and see for himself. 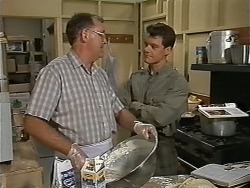 Over tea, Harold asks Eddie to give him his crepe recipe but Eddie insists that it's a professional secret. Kelvin tells Melanie that he's thinking of throwing in the Lassiter's job. Melanie has worked out that Kelvin was out with Andrea last night - and she is now convinced that he asked Christina out too! Kelvin tells her that he's too young to be tied down and he wants to get out and play the field a bit. Melanie made him realise that he's got more to offer than he thought. Melanie isn't impressed - Kelvin has turned into a two-timing rat! Kelvin says their relationship was only a bit of fun. Melanie starts to cry and says that she really liked Kelvin. She is very upset and throws Kelvin out of the house, slamming the door behind him. Then she collapses in tears on the sofa. Eddie tells Harold and Madge that he's only on a short trip this time. Madge and Harold invite him to stay with them - they've got a few spare rooms. Eddie agrees, thanking them. 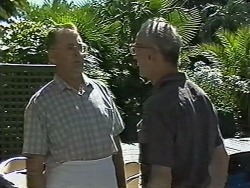 Joe goes over to talk to Dorothy. He tells her angrily that she has no chance of moving the fence - he's found a loophole in the legislation. Dorothy says she was going to come to an agreement with Joe, but now she's going to take it to court. As she reverses her car out of the drive, she accidentally hits Bouncer, who lies on the ground, whimpering.